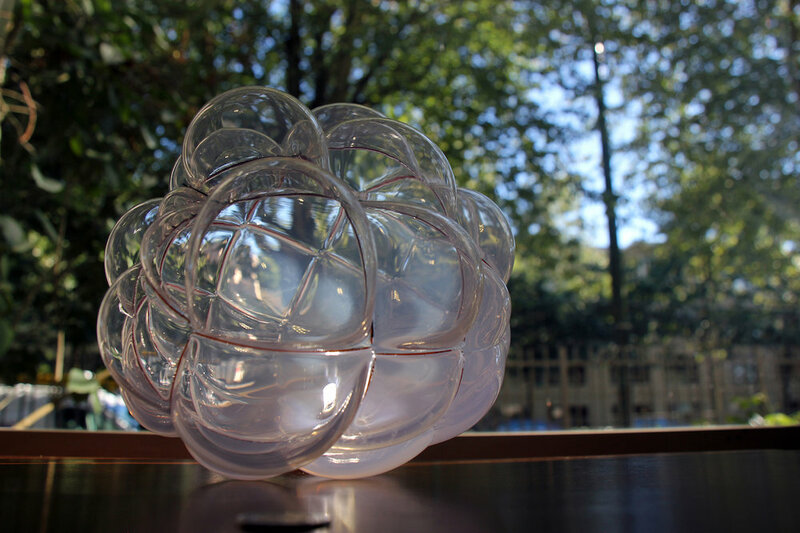 Cloud is a series of hand blown glass objects. Blowing molten glass into the inside of a hand knotted wire cage forms the unique, organic volumes. The copper cage is then removed leaving behind a faint copper shadow in the indents of the glass. While the form of Cloud is like that of a cumulonimbus cloud or a cluster of bubbles the light cast by Cloud is reminiscent of the cosmic phenomena of a starburst galaxy. Cloud is illuminated with an LED. Sasamat is a creative studio that strives to create a tension between sculptural form and subtle phenomena through the interplay of light, color and visual perception. Sasamat Creative was started by Robert Geyer and Rena-Li Kuhrt. Robert has a MFA from Tyler School of Art in Philadelphia and BFA from Emily Carr University of Art and Design. Rena-Li has a BFA from Emily Carr University of Art and Design.